As the closest-orbiting of Saturn's intermediate-sized moons, Mimas is occasionally captured against the planet's dim and shadowed northern latitudes. 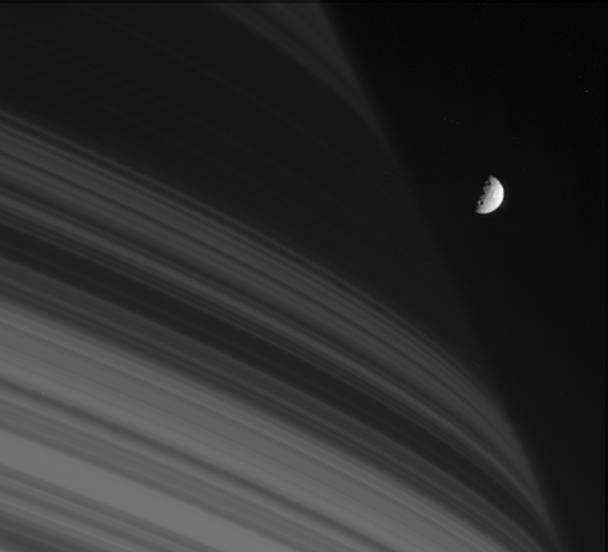 The moon is seen here next to the shadows cast by the dense B ring. Mimas is 397 kilometers (247 miles) across. The image was taken with the Cassini spacecraft narrow-angle camera on July 18, 2005, at a distance of approximately 1.6 million kilometers (1 million miles) from Mimas and at a Sun-Mimas-spacecraft, or phase, angle of 90 degrees. Image scale is 10 kilometers (6 miles) per pixel.